An exploration of fabric, dyeing, and quilting. Well, it seems that every year at this time I decide that I want to update my blog to say - hey I am going to update my blog more regularly. So here goes another attempt. I will be speaking at the Four Corners Quilters' Guild in Mount Forest on Tuesday, May 8th. I am excited about this opportunity. I hope to focus my talk on my journey in quilting and sewing an my excitement on getting into dyeing. I will be bringing many things with me to show and maybe give an insight on how to look at and user colour in a few different ways in quilts. 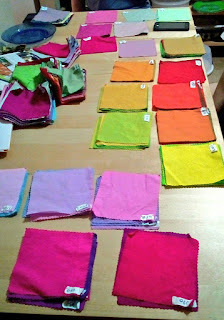 Understanding chroma and how balancing high and low chroma colours makes for more dynamic quilts. I will post more once I have finished putting my presentation together. I will have to miss the RCQG meeting as it is the same night, however, it should be a good adventure to get out to another guild and see what others are doing. I am currently at the Waterloo County Quilt Guild 2017 Quilt Exhibit. 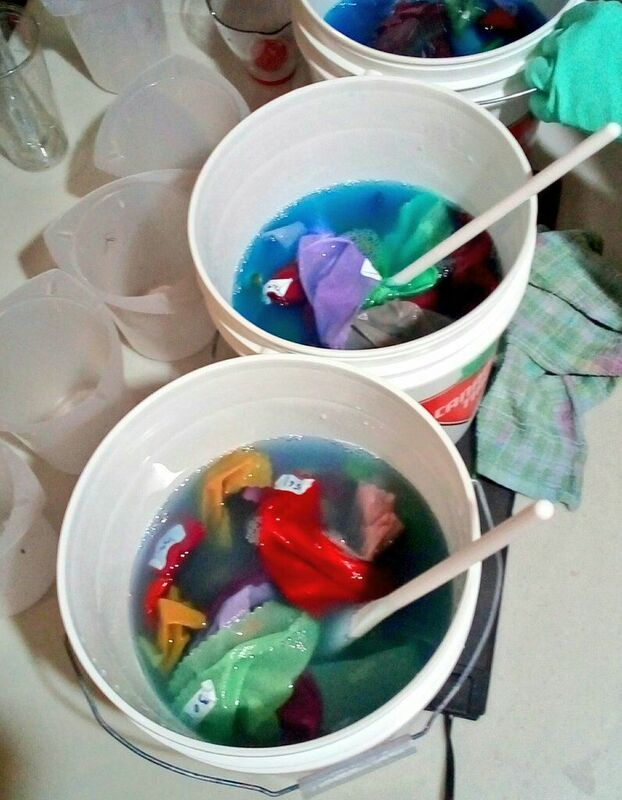 I have been meeting many great people interested in my dyed fabric. I really hope that if anyone was there they let me know in the comments. I have two quilts in the show. Both with my own fabric. Hope all that were at the show had a great time. If you want to talk to me about fabric - send me an email and we can talk. I have had a great weekend dyeing a fabric sample set. I had some help with some good friends, so it only took 2 days instead of a month. I can't reveal the exact process I have used here, but it is a process that I learned last year. I started out cutting up 343 6.5inch squares from PFD fabric. 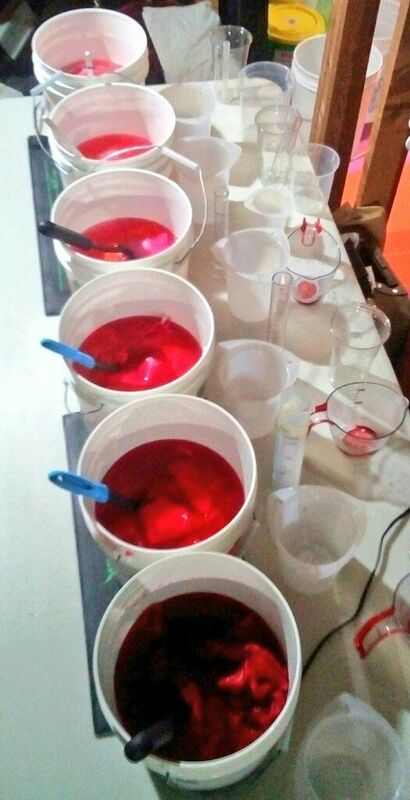 Then coded and sent through the dye prices to get them all dyed to the correct colours. Lots of stirring and stirring. This process is amazing it is quite a lot of work - but in the end I get a great set of samples that I can reproduce. 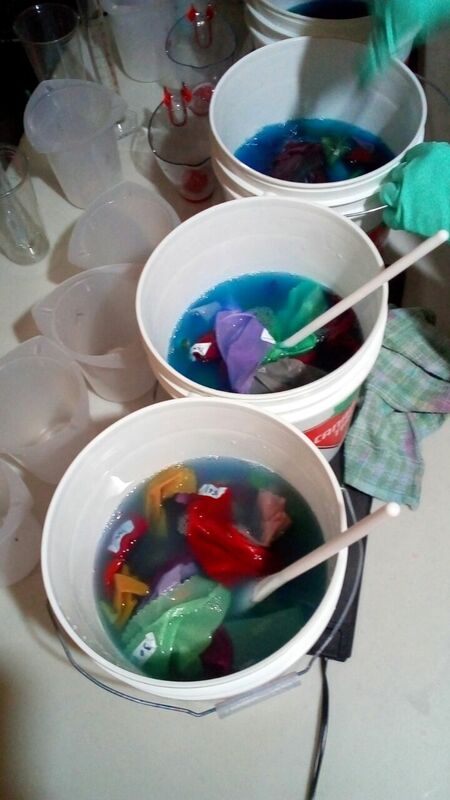 Using a process of over-dyeing I don't need to dye each square separately it just appears in the last set of dye buckets. Look colours forming before our eyes. Then they just need to be sorted - will need to be ironed and prepared for the next step. All set and ordered ready to cut up and place into the book. Will work on that over the next few days to get it all done. 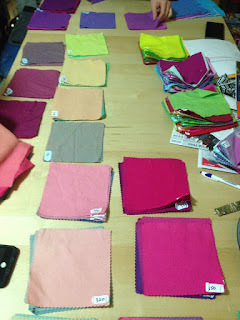 Next weekend, I will get some fabric dyed that I will get to use to make into a quilt. I will post an updated then. Well the past 6 to 8 months have been quite rough for me. My in August my mother went into the hospital (again). She had not been taking care of her self very well and had lost a lot of weight and had gotten to the point where she could not swallow very well. She responded well in the hospital and improved, however they told her that she should not be living alone. I have spent the past half year going back and forth to visit her and helping her settling in to a care facility. She is still in a shared room, however, she seems to be settling in well. I don't like being so far a way, however, I do have a job that allows for me to go out an visit her fairly often. I have been out every month for at least a week since she moved out of her condo. My next trip will be for Easter. 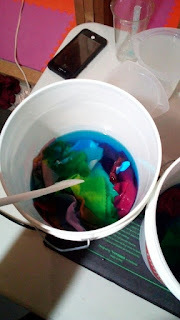 I am now feeling that I can finally get back into doing some dyeing and maybe even some quilting. I have rearranged my sewing room and long-arm room and next weekend, I hope to get my dye studio (grandiose word for corner of the basement) arranged so I can get some dyeing done. My fist plan is to do another of the colour families as I learned in Carol Soderlund's Workshop. I will be the second one that I have done since I took her course last year. I have 2 other colour families I would like to do, but of course there are 80 some combinations that can be done with the dyes I use. I also hope to keep up with this blog some more, I will try and touch base here at least once a week. If you are out there reading please let me know. I have not advertized this blog much, but it would be nice to know if people have found me. 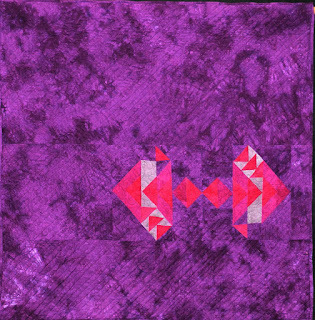 I thought I would make an attempt at a modern quilt - one that uses colours that are a bit bold and a pattern that references traditional quilts, but used in a modern way. I came up with this block. I then wanted to only use it twice in a 40 x 40 inch quilt. I have selected 4 colous of fabric, that I will dye my self - while this pattern is solid colour, it will be dyed using a low water technique that will give the fabric some texture. This I hope will be a very bold (and dark) baby quilt. This weekend, I will dye the fabric for this quilt and will post the results - the binding and backing will all be the dark purple. 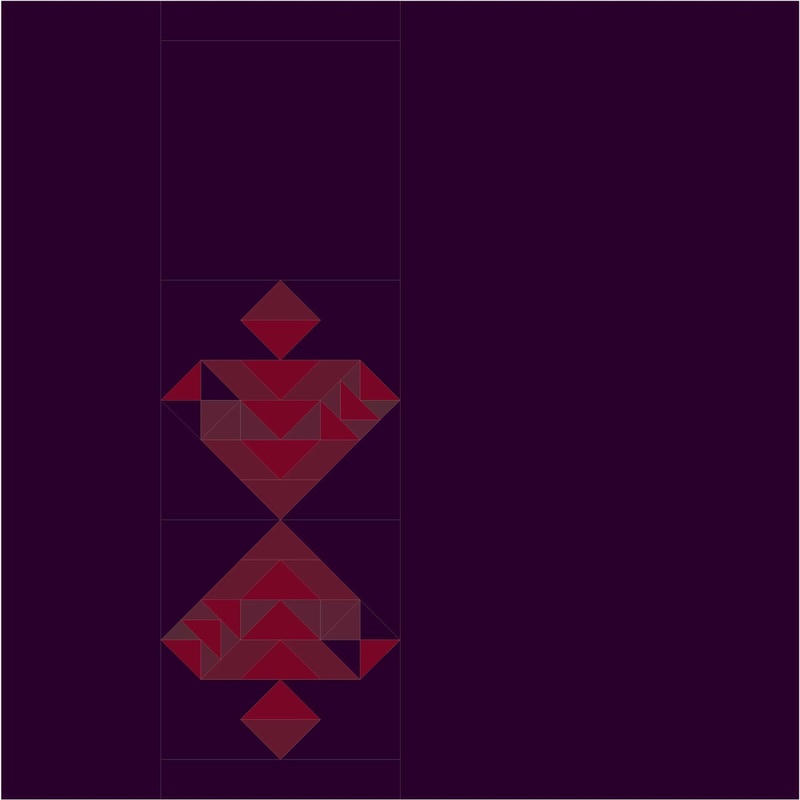 I am thinking of calling it something related to an hourglass - maybe The running hourglass, or even Mangled Geese. 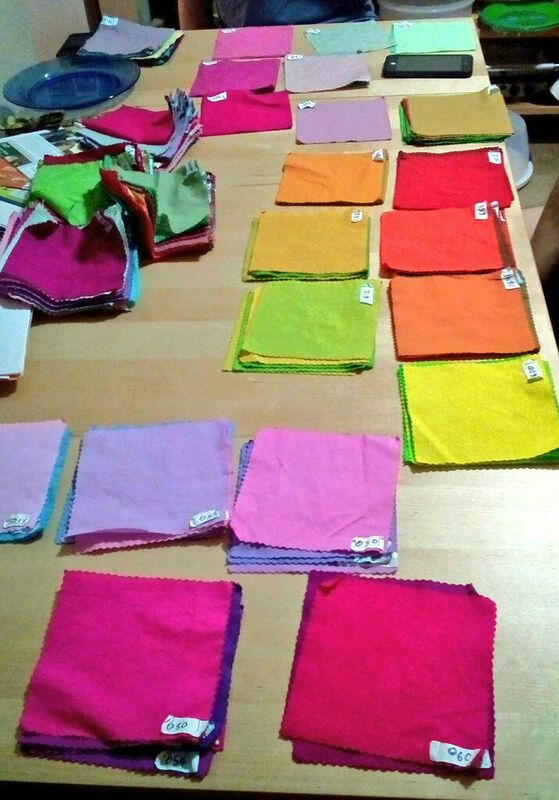 Well, I had my first public sale of fabric at my local guild. It went really well, the ladies seem to really like my fabric. Now that that is over and most guilds are on summer break, I am taking this time to catch-up on some UFOs. Almost two years ago a good friend of mine got married and I wanted to make him and his husband a quilt. I started it months before their wedding in hopes to get it done before... Well we all know how well that goes.... So today, I finally dug out all the blocks I had completed and tried to figure out what I was doing when I put them away. 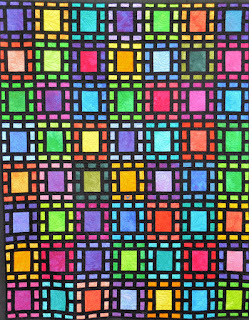 The quilt is called Totally Square and is in Kim Schaffer's book Quilts from textured solids. 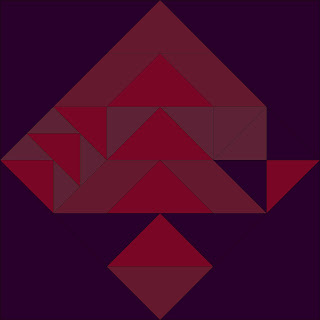 One thing that bothered me about this quilt was that the final quilt was in its self not square. I counted up all the blocks I had completed and realized I did many more of each of the first 4 blocks needed, so I decided to stop there and make the top from what I had. So, the quilt is not exactly as the pattern indicated, I also am adding an extra column to make the final project square. Here are some of the strips of blocks completed. One thing, I noticed that I thought I was using a scant 1/4 inch seam, however it seems I was doing a bit larger than 1/4 inch seams - thus, my blocks were not 8.5 inch square. I decided to cut them all down to 8 inch squares. To make sure they will go together well. But ended up with a pile of narrow strips of fabric on the sewing room floor. Tomorrow I will finish putting the top together and will post it. Then, I will need to get a back for it and get it on my long arm. 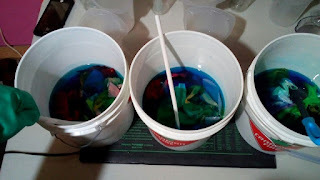 I have been playing with how much liquid I leave in the fabric after I soak it in soda ash solution. This pink was soaked then spun in the washer to get most of the liquid out. I can see that the patterning is somewhat different that when I just squeeze out as much water as I can after soaking it in soda ash solution. This is a range from yellow to a redish orange (each fabric has a different formula for the colour) I am going to bundle it as a group. 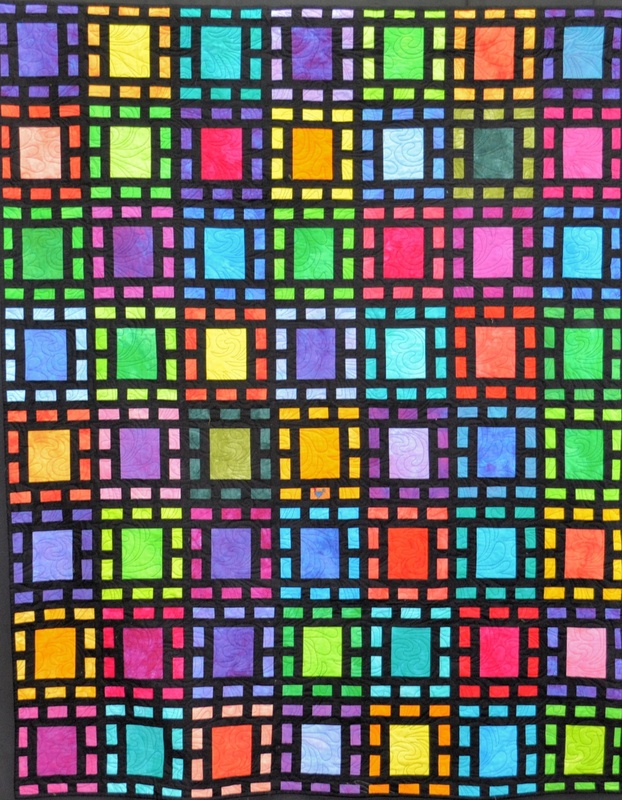 I think this would make a great Bargello Quilt. Will have to do up some designs and sew it up this summer as an example of what you can do with my fabrics. Each of these fabrics has the same formula for colour, just a different concentration of dye to fabric for each step. The yellow and orange play well with each other. Again, this is very low water dyeing and the yellow has broken out of the orange. Not as vibrant as the yellow to red above, but just as pretty. Howdy and welcome to my blog. I am using this blog to post my experiences as I explore fabric arts. In the areas of fabric dyeing and quilting.